Resources | Thai Health And Information Services, Inc.
provide free car seats & booster seats to low-income families. Funded by the EPA, THAIS, Inc. educates and increases awareness on lead poisoning for Thai families with young children in Los Angeles County. his kind support for the food bank program. Partnership every third Friday of each month at Bronson Court Apartment. computer tasks like surfing the web. Visit our fellow community members' websites. We have several pamphlets available on how to stay healthy. Please contact us if you would like a copy of any of the following pamphlets. 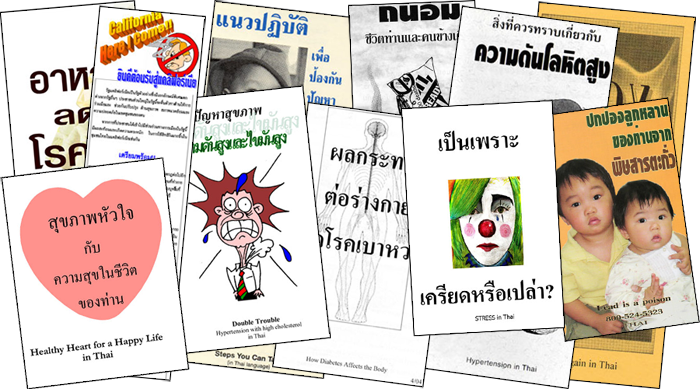 Copyright 2011 - Thai Health And Information Services, Inc.